An overall vision for a congregation is the most important aspect of a solid foundation. Think of vision in terms of a destination your church needs to arrive at in the future. A church needs to know where God wants it to go so it will know if and when it gets there. Visions are never measurable and are therefore distinguishable from objectives, which are always measurable. Visions are more conceptual and form the basis for strategies and objectives. It is from such a vision that mission statements are developed. A mission statement helps a church focus its preparation of budget and ministry, and sets the context in which objectives can be set. The statement needs to be clear, measurable, unlimited and, if possible, short enough to commit to memory so it can be used in worship services. The rolling model is an excellent tool for short and long-term strategic planning. The center of the wheel is the overriding vision of the church. If the vision isn't in place, nothing else works well. The five sections represent the skill needed to implement the vision, as well as the excuses people will give to maintain the status quo. While very few people have all five skills, most people have at least one. 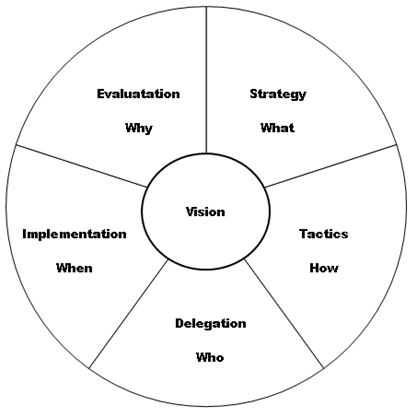 The model is in the form of a wheel because strategic planning is always a process that moves toward a destination. The processes represented in this wheel are thought, time, energy, skill, sequence, people, purpose, growth, and importance. The Church Growth Handbook by William M. Easum, pp 106-107. The Church Growth Handbook by William M. Easum, pp 110.